I remember my first official yoga class with a certified teacher, in 1993. It was an Iyengar style class with Gayna Uransky, at a healing arts school called Heartwood Institute, tucked away on a remote mountainside in Humboldt County, CA. After one class with Gayna I was hooked on yoga, which, up to that point, I had judged to be either too boring or too weird to be of any real use to me. Gayna taught a no-nonsense Iyengar class that challenged me on all levels–physical, mental, spiritual– and left me feeling a unique blend of relaxed and alert that I didn’t remember ever feeling before. Gayna’s classes always ended with a 15 minute savasana, during which she led us through a progressive relaxation, moving our attention through the body starting with the toes and ending with the head (although I would drift off to Someplace Else soon after the knees…). It went by so quickly and I never wanted to get up for the final Om at the end of class because I felt so relaxed and blissful lying there on the floor. After I graduated from Heartwood I moved to Seattle and started practicing Ashtanga Vinyasa Yoga, which is closely related to Iyengar (both BKS Iyengar and Pattabhi Jois, the father of Ashtanga, were students of the great Krishnamacharya). The main differences that I could see were that Iyengar yoga focused in more detail on one pose at a time, while Jois flowed the poses together (rather briskly and without much time to think) in a very specific order, with emphasis on breath, bandhas (core muscular support) and drishti (gazing places). We still ended every practice with savasana, but there was no guided relaxation, and in the Mysore style (self guided) class I took for many years, the students were left up to their own devices when it came to savasana. When I studied with Pattabhi Jois himself in India, the only instructions I got for savasana were to “take rest,” which he would say when he thought you had gone far enough in your practice for the day. Some people stayed in savasana for half an hour, some people stayed for half a minute. I began to notice that if I rush my savasana I feel more tired during the day, and also sort of irritable and raw. On the other hand, if I just let my body stay as long as it wants I can reach that wonderful state that Gayna introduced me to. There is always a moment that, if I wait long enough, I will feel a certain release and my body will let out a sigh. I have started to look forward to that sweet moment of surrender. Afterwards I get up feeling soft, happy, refreshed and grateful, like waking up from a good night’s sleep, only better. Colors seem more bright, flavors more rich and the world is a more beautiful place. I have more patience, I am basically a nicer person all around. What is going on? It turns out that yoga acts upon all of our layers (or koshas), helping to release knots and blocks in our being so that we can function optimally. As we know, asana works wonders on the anamaya kosha (food body), pranayama enlivens the pranamaya kosha (energy body), and–as we will learn– chanting, listening and sense withdrawal nourish the manomaya kosha (mental/emotional body). Practices like meditation feed the vijanamaya kosha (wisdom body), and ritual, prayer, and chanting are all beneficial for the anandamaya kosha (heart or bliss body). 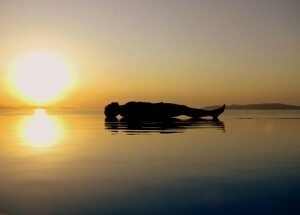 What I feel in a good savasana is this: the total release of the physical body as effort ceases and tension eases; the free flowing buzz of the prana (energy) body moving easily through the relaxed and well positioned physical body; the quieting of the outer mind as external sensory input decreases and inner sensing increases; the stilling of the discriminating mind as thoughts slow down and inner knowing is revealed; and under that, waiting to be revealed– the body of bliss. Ah. Savasana is a special pose, named after a corpse–because you become so still it is as if you are dead. Also if you are truly comfortable, and still for long enough, your body becomes so quiet that it “disappears” from your sensory awareness and you are left floating there as if without a body. Iyengar said savasana was one of the most difficult poses because there is nothing to “do,” only to be still and quiet the mind which can be very, very difficult for many of us, especially in our Western culture of Always Busy Doing. Even our vacations can be busy! Not much value or emphasis is put on merely Being. As a matter of fact, many of us have an aversion to stillness, we judge it as lazy or boring. “I’m late, I’m late, for a very important date, no time to say hello/goodbye, I’m late I’m late I’m late!” becomes our mantra as we hurry along to the next errand on our very long “To Do” list just like the White Rabbit in Lewis Carroll’s Alice and Wonderland. Savasana, like meditation, works on the more subtle layers of the mind, by offering a place to observe the mind without outside distractions. The senses are turned inward, the eyes and mouth are closed, the breath is relaxed. The body is relaxed. It is a very healing practice for the whole body, and especially the mind. The mind needs time to rest and digest just like the physical body. Our modern senses are bombarded with more stimulus than ever before. We can start to get mental indigestion and even constipation! It becomes harder and harder to absorb any more information and the world seems to be spinning faster and faster and we just can’t keep up! Stress builds and immunity drops. On the other hand, when we stop thinking and doing so much and practice just Being, our nervous system shifts out of fight or flight. If we practice savasana faithfully we will find that we feel more energized, less rushed, and more efficient. Join Tracy and Executive Director Ashley Dahl this Saturday at their I [heart] Savasana workshop. © 2019 8 Limbs Yoga Centers Seattle, Washington all rights reserved.